Can you improve off of Kimball House? The crew puts up a good effort. It’s often hard for restaurateurs—even highly successful ones—to come up with a second concept that’s as passionate as their first. This isn’t the case for the team behind Kimball House, the magnificent cocktails-and-oysters depot in Decatur that evokes the glories of the past. 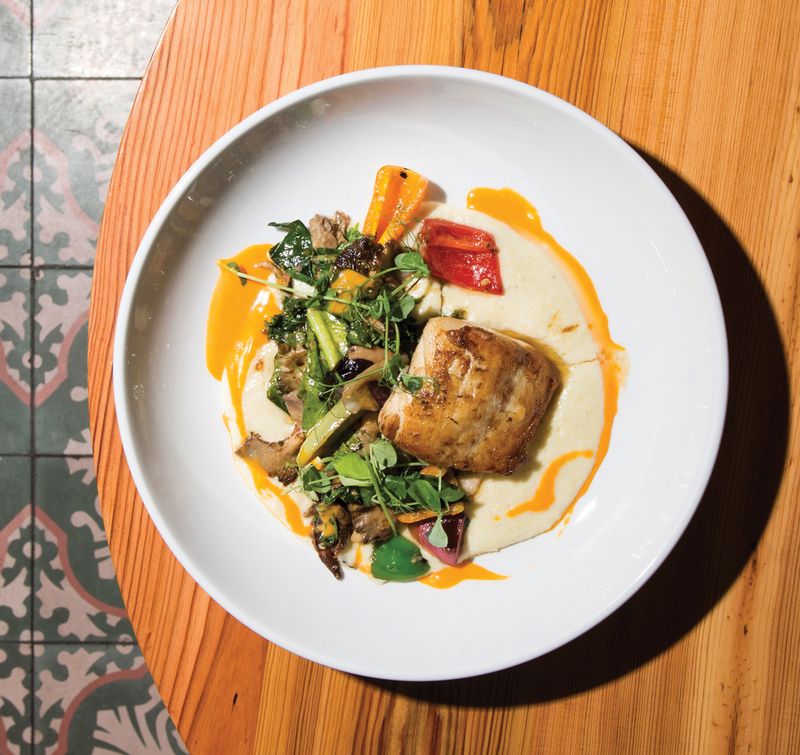 The owners’ new venture in Krog Street Market tells an equally compelling story about the fresh-caught seafood they grew up eating on vacations along the Gulf Coast. 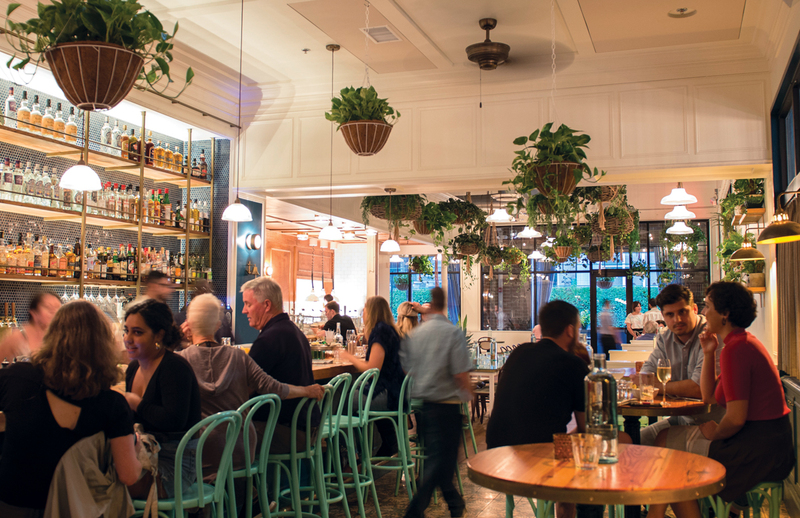 Cheerful, beachy, and chic, the restaurant earnestly pursues its mission—rehabilitating the Southern oyster and commanding respect for sustainable, regional, relatively affordable seafood—but it doesn’t get preachy about it. The bar program taps into the same joyously relaxed state of mind with bright, refreshing drinks that channel leisure time at the shore. Executive chef Daniel Chance, formerly of Bacchanalia and W.H. Stiles, isn’t a household name . . . yet. 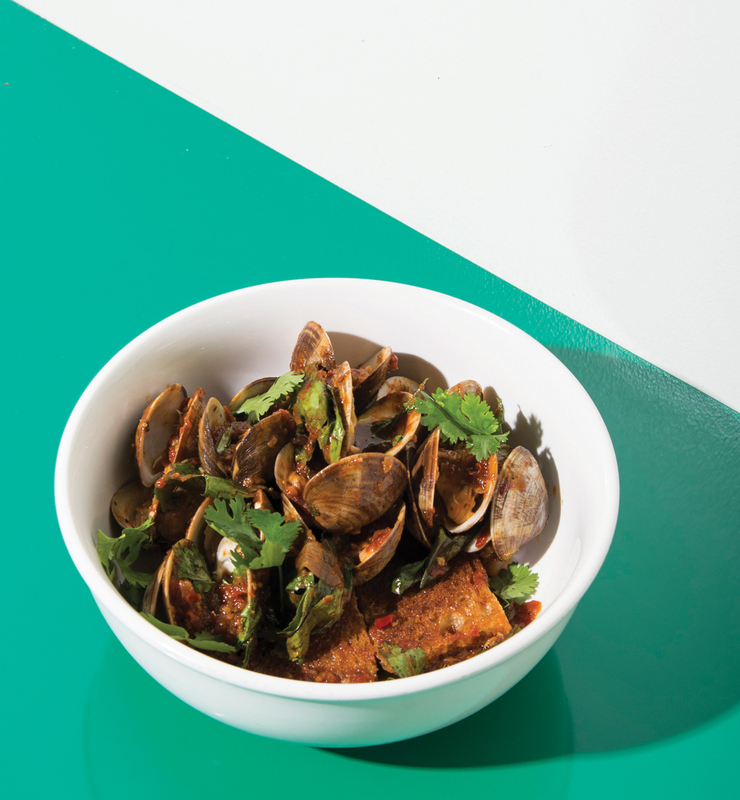 But his ability to add unexpected fine-dining twists to the simplest seafood dishes justifies the trust placed in him by Watchman’s cohesive crew of owners. That crew is composed of the famous Miles Macquarrie, king of bartenders; Bryan Rackley, oyster nerd extraordinaire; and a couple others you’ll recognize from Kimball House: front-of-house gents Jesse Smith and Matt Christison. Big props to Rackley: The bounty of oyster farmers in Alabama, Florida, and other Southern tidal waters is on full, glistening display in the 10-plus varieties he selects daily. And his insanely detailed tasting notes—“parsnip and bonito flakes” or “clarified butter over scallops”—are as rewarding as the oysters themselves. Relatively unknown types such as Murder Points, Isle Dauphines, Wakula Mystiques, Boondocks, and Salty Birds are diverse in appearance, salinity, and texture. All are perfectly detached from pearlescent shells and contain enough of their own extract from the sea to make you appreciate you the word “merroir,” though you won’t get the mind-blowing geographic and gustatory range you would at Kimball House. Watchman’s isn’t just (or even mainly) an oyster house, and you should order generously from the rest of the menu—which can change any given day thanks to a chef who boasts that his fish is so fresh it “still has rigor mortis.” Chance’s innovations include a fritto misto of baby herrings with green onion and black garlic aioli; a riotous ceviche verde with corn nuts and cilantro puree; a sweetly fresh shrimp roll on a split, buttered Sally Lunn (a cross between a brioche and a Parker House roll); a fish collar (which some call the chicken wings of the sea), basted in white Alabama barbecue sauce, that’s fun to tear apart; and a hearty gathering of steamed clams bathing in a broth of chili butter and vermouth that’s thickened with sourdough bread. Sustainable bycatch fish such as three-tails, pompano, and lesser snappers and groupers are virtuously served as tartare, crudo, or roasted whole and tiled with piquant fresh citrus, charred onion, and green olives. The $28 snapper with okra and fermented vinaigrette is worth the splurge. Seafood-averse customers (wait, why are you here?) may frown at a ribeye plated with whipped potatoes loosened with salt cod cream, but they’ll be comforted by the hush puppies with hot honey, Cuban-style red beans and rice, succotash with tomato and peppadews, and glossy whole Sally Lunns flecked with crunchy salt crystals. Desserts from Kimball House’s executive pastry chef—requisite Key lime pie engulfed in meringue, fig galette adorned with fig leaf ice cream, banana cream tart with peanuts—help send you home fully happy. Once again, Macquarrie has crafted a cocktail menu so true to the spirit of the restaurant that it threatens to divert the spotlight from plate to glass. 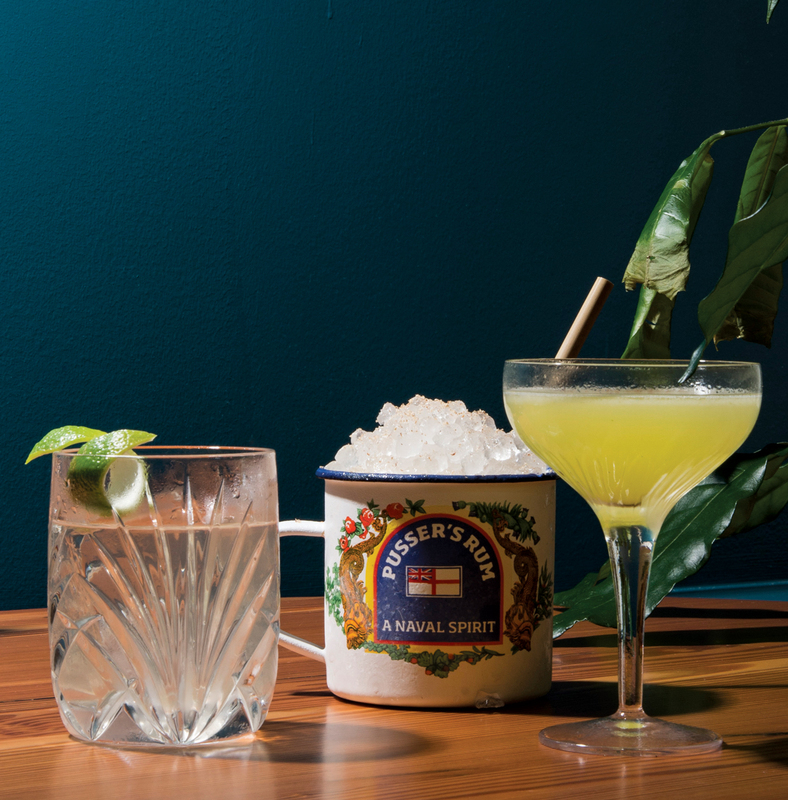 Domes of pebble ice rise above candy-colored mezcal swizzles and mojitos; the eponymous house drink is a boozy yet balanced combination of gin, vermouth, verjus blanc, and chartreuse; and well-mixed daiquiris and other rum drinks blow their competitors out of the water. But the real coup for Watchman’s is the custom-made chartreuse chiller, which dispenses shots of the green herbal liquor at peak viscosity—perfect for washing down with a beer chaser. The bar staff’s upbeat banter pairs well with their professional ethos. Whereas the previous occupant of this prime corner of Krog Street Market, the Luminary, was deadly serious, Watchman’s is much more chill—casual but stylish. The decor might remind you of your best vacations. Dozens of woven plant baskets dangle overhead, bringing the ceiling height down to a cozy level. The space, divided into several separate areas (bar proper, smallish oyster bar, glossy booth area, comfy patio), is sunny and fresh, with splashes of pale aquamarine evocative of the shallow sea and walls of dark teal and black penny tile that suggest the ocean’s depth. Kimball House is a tough act to follow, but its owners have created something similarly remarkable with their sophomore effort. At Watchman’s, the team builds on the connections it has forged with Southern fishermen and oystermen, and the new venture deepens its owners’ devotion to Southern seafood. Good seafood is never cheap (you wouldn’t want it to be), but the food served here comes at a price within reach, and the quality more than justifies it. 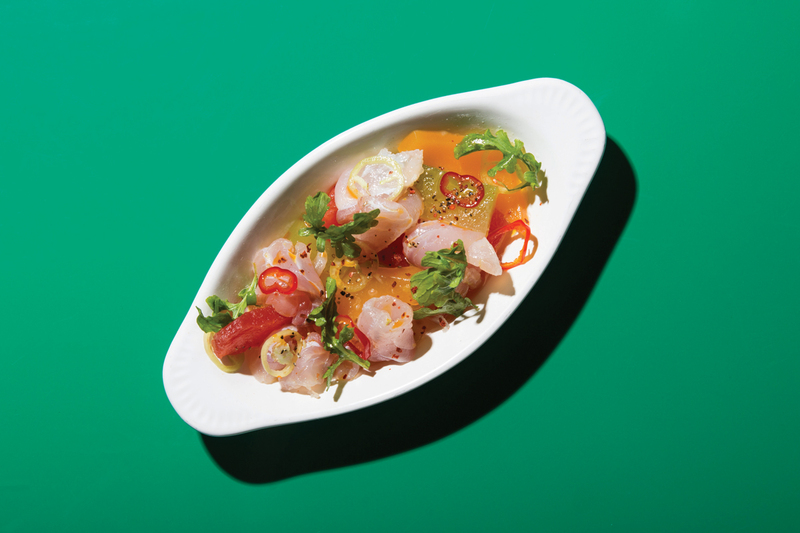 Plus, the restaurant has abundant style—and, of course, Miles Macquarrie’s badass cocktails—to match its substance. This article appears in our November 2018 issue.